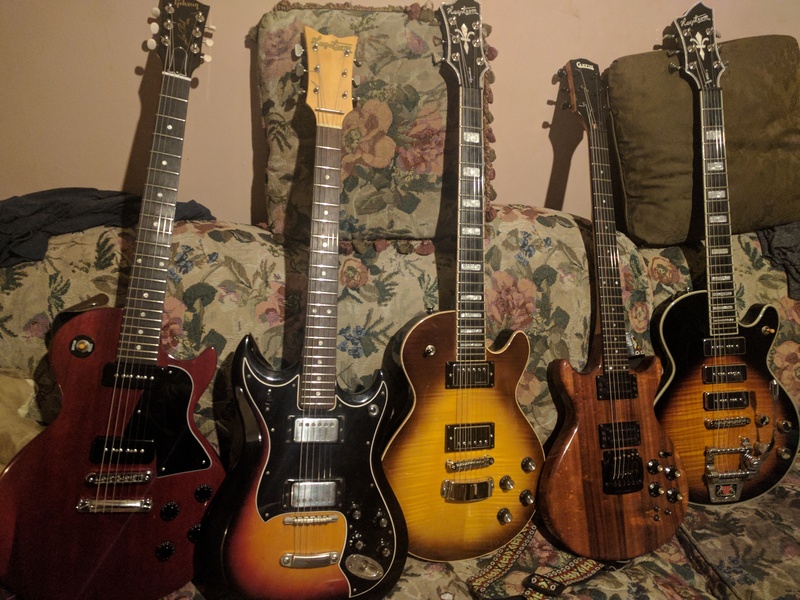 I unstrung, cleaned, oiled, and restrung all five of my electrics in my (compared to many) humble collection, so I lined the crime family up for a shot. Hope to eventually add a Strat type, a Tele, and a semi hollow to the collection, but that's a ways off. It's well known around here how bad i want a CS6 in Korina to be a main gigging guitar but that's useless unless I get a portable 1x12 combo like the Mercury V that I can use now that my gigging and recording unit is at last coming together with some good young talent again tweezed from the jazz schools here in NYC. Lugging that eighty lb x100b combo around will be too loud, too heavy, and too much...(although it's probably more versatile than even the Carr). I know some of you have some amazing collections. 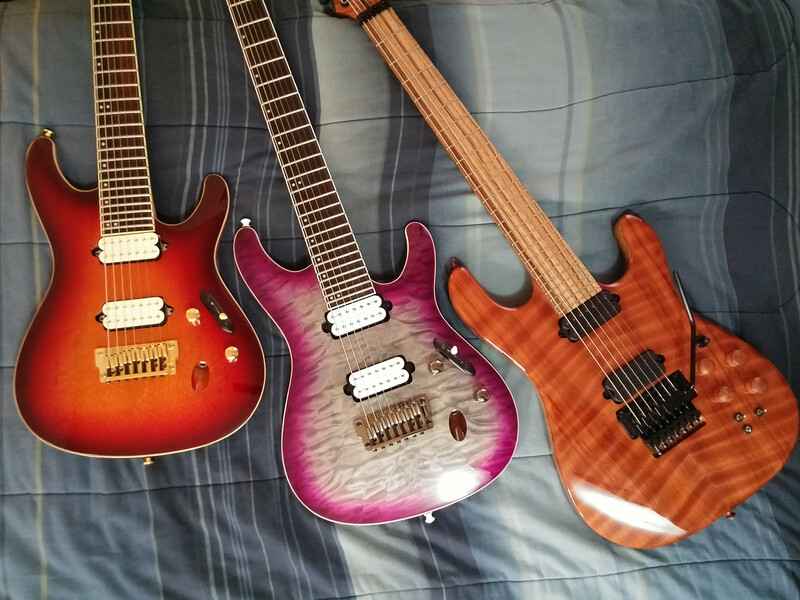 Show them off.. All brands in total, not just Kiesel/, Carvin. Last edited by Doctor Turn on Mon Jul 10, 2017 11:59 am, edited 1 time in total. Here's an updated picture of my electrics. The only change is that my Fury Fireball (bottom right) was sold to help fund my CS build. Last edited by Doctor Doug on Wed Jul 05, 2017 6:05 pm, edited 1 time in total. Couple of interesting units in that there crime family . . . what's that little headless sucker to the right? Doctor Turn wrote: Couple of interesting units in that there crime family . . . what's that little headless sucker to the right? It's a travel guitar that I bought when my band was touring last summer. It's really cool and you can plug it straight into headphones. I take it on tour and when I travel with the wife. The best is plugging right into the tour van's stereo and writing songs on long drives! I wanted to take this opportunity to share something about myself that I've learned from this forum...particularly from you. For all my years of guitar playing I've never paid attention to the technical aspects of the instruments I play. I usually just see a guitar that I like the look of, play it and then decide if I hate it or not. The reason behind liking or disliking an instrument never made a difference to me. It would either sound weird or feel weird and I just wouldn't like it. I never gave scale length a thought until I started hanging out on this forum. 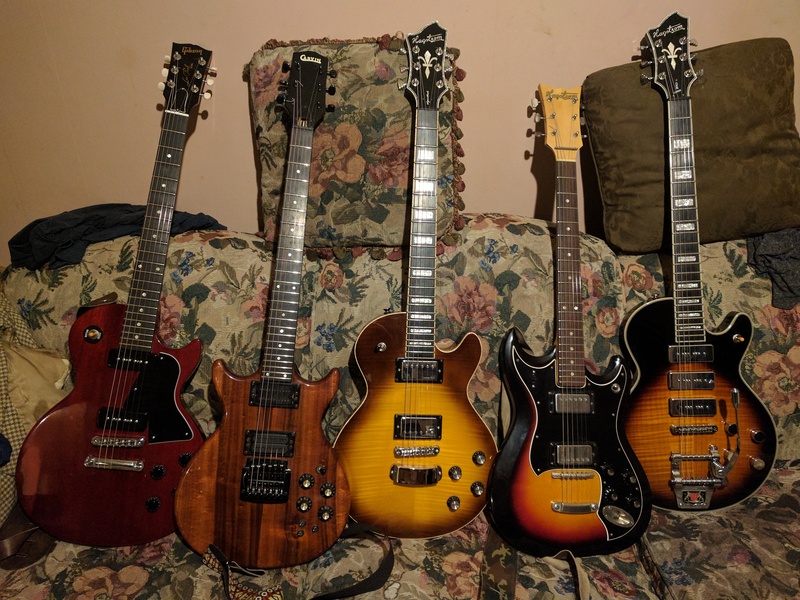 Now I look at this picture of all my electrics and I realize that the only one with a longer than a 24.75 scale is the one Carvin. You're right. There is something magical about that scale length! I keep telling myself I'm keeping the Sabres, but the JB gets all the love. Great family photos! Love the Hagstroms. Oh that flamed red wood is SO nice. 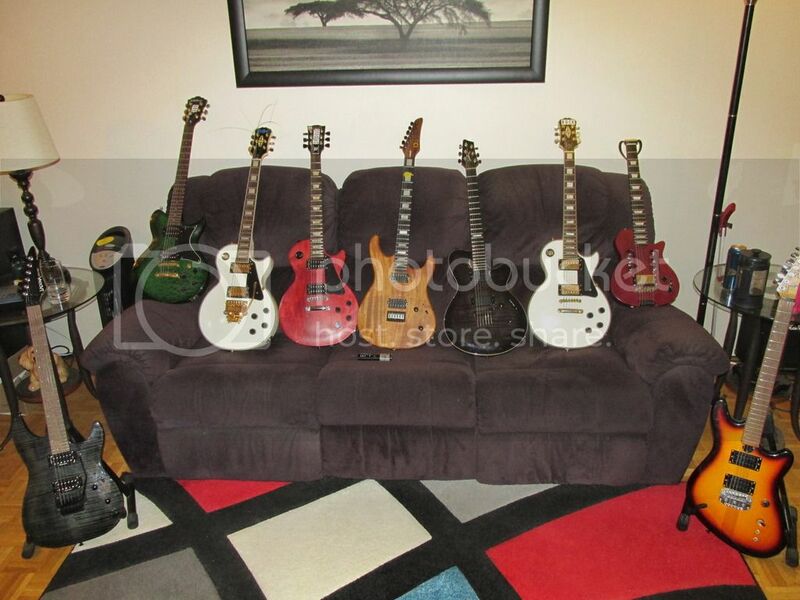 I need to make to time to put the family together, but then my wife will know how many guitars I HAVE. Yea, this thread was a really good idea. Or a bad idea, depending on how much I can handle wanting new gear right now lol. I will revisit this later when I have the chance to take pictures of everything. But here are my two favorites at the moment. This thread is a good idea! I haven't done a full collection pic since I got my last two Kiesels. I brought them all out to the living room this morning. Well, welcome to cubeupload... another from that same day before I settled on the order putting all the Hags together. The LP is my favorite of the bunch - screams rock n roll machine to me. Any acoustics in the fam? Thanks. It's a bitchin Special, love it because of the ebony board, which makes it unique (also an unbound board, which is rare for Specials... I wound up very happy with that purchase). Also because it has a full tune o matic bridge with stop tail (which I top wrapped). 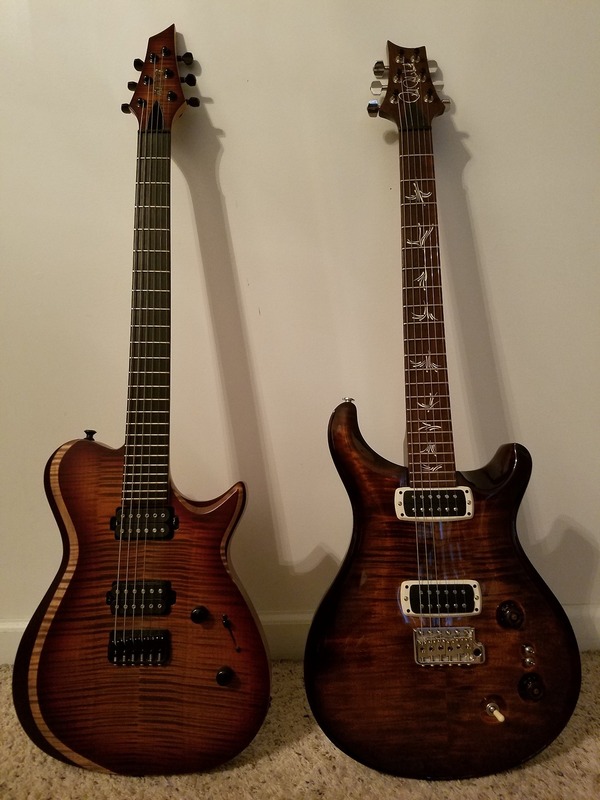 Of course my personal favorite is the old Carvin, but it will probably be that way until I croak. But i tell ya, the guitar I wind up recording with the most, even when I don't start out intending to, is the triple p90 Super Swede, which happens to be the least expensive one of the bunch (720 bucks, although I did put a couple hundred into it with the rewiring/new pots). It always solves my sonic problems easiest when recording. Got nothin' on some of you guys collections, I know. Some guys know what they like and like what they know. Me, I'm all about variation. Every guitar has to have a different feature, something I couldn't do with another in the bunch. So I got a nylon string, a bass, a les paul, a 7 string, a floydy thing and a strat. I have also taken to borrowing my friend's acoustic for extended periods of time. So I got that going for me which is nice. Variation is fun. Guitars are probably the single thing I can't ever see being redundant. I'd really like to order a semi-hollow, S-S-S JB207, and an EMG bridge pickup only DC...Vader bass and guitar...so on and so forth. 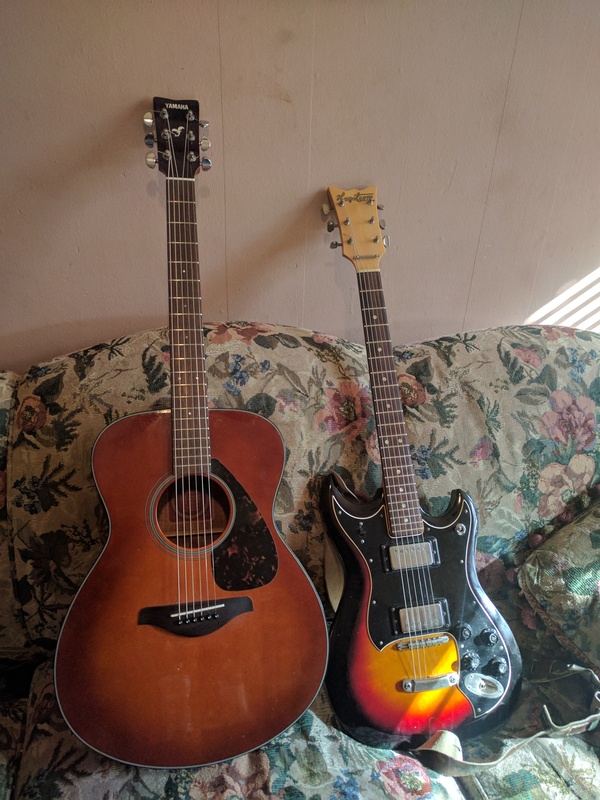 I have the guitars I'd take to a desert island, but I'd love to have an arsenal to round it out a whole lot more. Different guitars tend to lead me into writing differently, and it's not the kind of thing my Axe FX can imitate. Heh heh.. screw you photobucket! I recovered my initial portrait and uploaded it to cube upload.. so, after swapping out the old photobucket link for a new cubeup link, my opening post for this thread looks normal again, with the same exact photo..